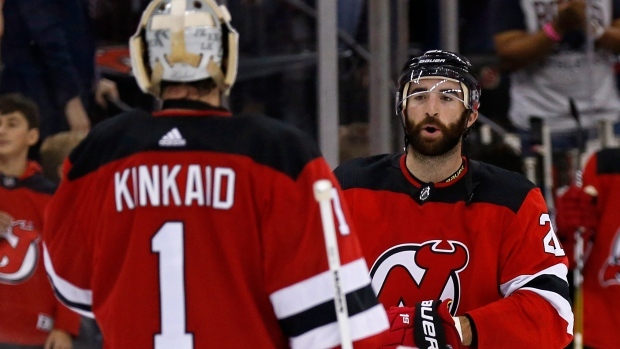 NEWARK, N.J. — Sharp in Europe, the New Jersey Devils played equally well at home. "We continued the way we played in Sweden and were on top of them early," Palmieri said. "I think all four lines, the defence, and Keith, all had a great game." The Devils' defence did an outstanding job stifling the Capitals, who had scored 18 goals in the first three games. "It felt like they had six or seven guys out there," Capitals defenceman Matt Niskanen said. "They were skating on ice. We were skating through mud. Give them some credit because they played really well, and we were not very good." The remaining drama centred on Kinkaid's bid for a fifth career shutout. He made an outstanding stop on Jakub Vrana, stretching out to make a pad save midway through the period. NOTES: This was the first of four straight home games for New Jersey. ... Kinkaid will carry the goaltending load as Cory Schneider continues his recovery from off-season hip surgery. Schneider has resumed skating with the team. ... Hall was greeted by "MVP" chants as last year's Hart Trophy winner was introduced to the crowd. ... New Jersey scratched defencemen Eric Gryba, Steve Santini and RW Drew Stafford. The Washington scratches were C Jayson Magna, D Madison Bowey, RW Tom Wilson and LW Nathan Walker.